Camshaft alignment tool 1 – No.11 4 281. Camshaft alignment tool 2 – No.11 4 282. Camshaft alignment tool 3 – No.11 4 283. Flywheel/drive plate timing pin – No.11 0 300. Sensor gear alignment tool – No.11 4 290. Timing chain pre-tensioning tool – No.11 9 340. Torque wrench – No.00 9 250. Insert flywheel/drive plate timing pin  . NOTE: Engine should not turn if flywheel/drive plate timing pin fitted correctly. Ensure inlet camshaft lobes for No.1 cylinder angled upwards  . Ensure part number on each camshaft is facing upwards  . Ensure exhaust camshaft lobes for No.6 cylinder are positioned as shown  . Ensure camshaft alignment tools can be fitted  ,  &  . Slacken central bolt on each camshaft adjuster  . NOTE: If chain tensioner is to be re-used it must be drained of oil. Compress plunger slowly twice. Ensure sensor gear locating holes at 9 o’clock position  . Install sensor gear alignment tool and secure to cylinder head  . Screw in adjusting screw until in contact with guide rail. 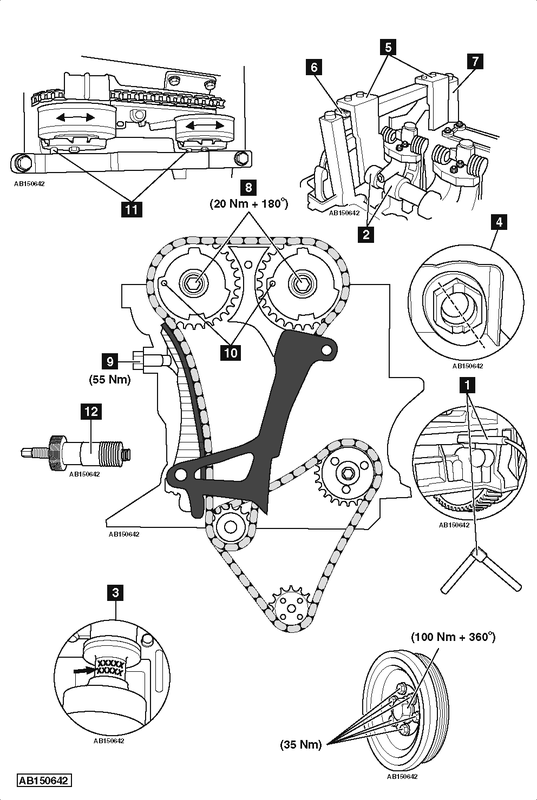 Pre-load timing chain with tensioning tool to 0,6 Nm  . Tighten central bolt on each camshaft adjuster  . Tightening torque: 20 Nm + 180°. NOTE: Central bolt of camshaft adjusters MUST only be used once. Flywheel/drive plate timing pin  . Sensor gear alignment tool  . Camshaft alignment tools  ,  &  . Timing chain pre-tensioning tool  . Install tensioner assembly  . Tightening torque: 55 Nm. Ensure flywheel/drive plate timing pin and camshaft alignment tools can be refitted  ,  ,  &  . NOTE: Crankshaft pulley central bolt MUST only be used once. Im doing a cylinder head job on the same engine and I was wondering where does the piston number 1 sits when its on time nd Pin in flywheel ?